A curated newsletter is a great way of staying on customer top of mind and getting your messages across effectively. Read on to find out how you can leverage the power of a curated newsletter in your industry and rock the finance world, one email at a time! To say people in the finance industry are busy would be an understatement. No matter which part of the finance industry you belong to– financial advisor, stock broker, money manager, fin-tech, mutual funds, etc., your day is jam packed with numbers and excel sheets! Did you know, people working in the finance industry spend around 80-100 hours a week in their office? That’s a lot of office hours! Sure, you have your team set up to help you out, but in order to stand out from the intense competition, you need to go above and beyond your normal routine. And there are not only your contemporaries you need be worried about. The rapid digitization of consumer goods and services is disrupting the age-old structure and making self-service investments easier and convenient for people. The introduction of services like Robinhood, that have become popular on the basis that you don’t need a financial advisor to make your trades. Self-service investment options are gradually becoming the norm; taking the middleman out of the equation. However, there always will be a segment of the market who either doesn’t have the time or expertise to manage their assets efficiently. Individuals, organizations, endowments, etc. are still looking for the best financiers to help them navigate the markets, as they lack the skill and expertise to do so themselves. The challenge is to show these prospective customers that they can trust you, your research abilities and investment strategy. Customer service is one of the most important parts for any successful business. As competition increases it’s becoming more vital to satisfy the needs and expectations of your customer to reduce churn. The stats are there to prove it. Nearly 3 in every 5 Americans would try a new brand or company for a better customer service experience. As much as 54% of millennials, 50% of Gen Xers and 52% of baby boomers said they stopped doing business with a company, because of poor customer service. The most efficient and effective way to outreach customers is email. According to Radicati’s 2016 Email Statistics report, email will be used by 3 billion people by 2020. That’s almost half of the world population! Shocking, but true. People have loved, are still loving, and will continue to love email (at least until the robots take over). Sending engaging, meaningful and beautifully designed newsletters to your customers and prospects is a cost-effective way to reach, engage and build trust. How often do you email your customers, prospective customers & influencers? Is it for their monthly invoice? Do you send them a daily, weekly email or is it more like once every month or quarter? What kinds of information are you sharing? Why are you sharing information? Is it even useful? How long does it take you and your team to create? This is one of the most important questions. There are a ton of great ideas in this world, but too much time can stop any great idea dead in its tracks. Are there too many unanswered questions? Don’t worry, as you read on, all of these will be answered. More importantly, you will learn how to create a finance related newsletter in less than 5 minutes. Your clients, followers, and prospects are going to love hearing from you! 1. How often should I be communicating with my clients? As often as you can! The best way to provide customer service at scale is email. Why? A study by Nielsen Norman Group shows that when asked to opt-in to receive updates from a company, only 10% elected to do so through Facebook, while 90% chose to receive email newsletters. Newsletters can help you strengthen client relationships, cross-sell, improve client service, build brand awareness, and generate leads. It can help your customers understand market trends. It shows your intelligence and insight on these trends. It provides a personalized touch that most of your peers aren’t able to do because of limited time and resources. 2. What type of information should I share? The most important part of your newsletter is the content and information you’re sharing. Creating and curating content that engages your customers is important to influence and build trust. With so many distractions online, it becomes near to impossible to consume news that actually matters. 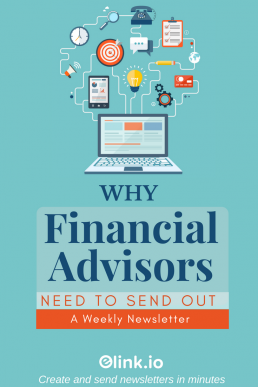 You can help your readers save time and effort of going through the plethora of information on the internet and giving them their daily dose of financial news right in their inbox. A curated newsletter, one that comprises of content from various sources is a good way to give the complete overview of the market to your readers. The financial world is complicated. Everybody need help with mutual funds, market volatility, investment strategies, and so on. If you can educate your readers on important topics like these, you can quickly gain their interest and establish credibility. An educational and useful newsletter, helps build up your image of someone who knows what they’re talking about. A newsletter that teaches its readers, especially younger audiences, how to save money , pay off debt, invest in the right places and gradually make more money is bound to have a lot of attention and engagement. Technological advancements in the finance industry, is quickly gaining traction and attention. Let your customers, understand where the market is headed to in terms of technology. All of customers will need to adapt to changes with digital products and services. Growing interest in digital currencies like Bitcoin, CoinBase, etc. will be interesting topics to cover in your newsletter. Have your readers make intelligent investments by giving them the ups and downs of the stock market, your stock picks, OTC market insights, etc. Your readers will love you if you are able to provide them with rich data and unique perspective. That is afterall, why they have hired or are following you! So you don’t have time to make a visually appealing newsletter. Well, guess what? We have the perfect tool for you. You can create and send a curated newsletter in a matter of minutes with this awesome content management tool! We’re going to show you how you can take 10 minutes out of your busy schedule and turn your research into a professional newsletter. Yep. Elink.io is a content management and curation tool that allows anyone to create a visually appealing and mobile responsive newsletter in minutes! elink.io works by letting users choose a newsletter template and simply add links to content (fin-tech news, financial videos, investment podcasts, stock market updates, specific company news, etc.). elink automatically converts those web links into visual blocks with a picture, title, and a short description. You can add a header, some intro text, your company logo and hit submit. It’s that easy! The best part? You can switch between elink’s 19 beautiful templates anytime you want and preview and test each one to see which one fits your design needs. All the templates are responsive and look great on all devices. Let’s dive into these four simple steps of curating and creating a newsletter with elink. Copy and paste links to the content you want to share with your audience in your newsletter and elink will automatically generate a picture and a descriptive text regarding the link. You can share anything- market news, fin-tech stories, educational videos, financial documents – basically any content on the web with a link! You can even make use of elink.io’s Chrome Extension to quickly add links to your newsletter. It’s a smart way to save relevant content across the web and start creating your newsletter as you go through your normal online life! Hit publish once you make sure that everything looks perfect! After publishing, go to your dashboard and select the newsletter button. You can share your newsletter via Gmail, MailChimp or any third party email site by just copy and pasting HTML code. elink.io’s automated HTML code works great with all of the major email service providers like Aweber, Campaign Monitor, Active Campaign, Get Response, Mad Mimi, etc. You can even copy and paste your elink.io embed code and add it to your website. It’s a great way to repurpose the newsletters you create into helpful web content to keep your website looking fresh. Cool, right? It’s time for you to start curating newsletters for your audience, with a little help from elink.io! I still do not have a newsletter, admittedly my biggest blogging failure thus far. I like the perspective you presented here, that by sending a newsletter you are able to reach out to do more than present an invoice or other not-so-fun business emails. I feel that a newsletter allows you to show more personality, attach a few interesting articles, etc. It’s a nice way to set yourself apart from the competition. I agree with everything in your post. I interned at a firm while I studied for the series 65. I used to call clients and inform them the owner wrote a book. They didn’t recognize the name of the firm and their financial advisor. I do not have a weekly newsletter… in fact I don’t have one at all… after reading this I will be better about making time to do one and get it sent out . All the points are so much helpful. Newsletter is the great source to reach out to the readers. I’ve never heard of elink will have to check this out. I agree that newsletters are very important. I knew it was important to send out newsletters to my customers but I always put off doing this because it doesn’t seem “as important” as the other tasks. But now I know how important it is, I’ll be making sure to send more newsletters out. Thank you. i am sure its going to help me creating newsletter in a minute and that too with good content. It is a very useful article, Thanks for sharing your good thoughts. A newsletter is so very important. Thanks for sharing your good thoughts.